I apologize for the delay in getting these samples up for you. I have been hit pretty hard by a nasty cold, but I'm finally starting to feel better. 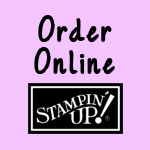 Here are a couple of sample cards I have made with Stampin' Up! 's newest product, My Digital Studio (MDS), which will be available on October 1st! They only took a few minutes to create. I used the Designer Templates for these cards. I did make some changes to each of the templates. Hopefully I will have some more samples up for you later this week. TGIF! What another long week...I much prefer the weekends! I apologize for not posting yesterday, but I was completely exhausted when I got back from my appointment yesterday evening that I just went right to bed! Today I left work early because I wasn't feeling well and let's just say that I should have left earlier because I didn't make it home before I got sick...in the car no less. I really can't wait for this part of the pregnancy to get over. Anyway, yesterday I had my first ultrasound...just on the monitor...sorry, no pictures yet. I thought there might be a possibility of having twins because my grandfather was a fraternal twin. However, it looks like just one bun in the oven. We did get to see the baby and his/her heart beating as well as listen to the heartbeat. That was neat. Now I have to wait another month before the next one...I hate this waiting thing! Anyone have any neat baby stories or hints/tips/tricks for this new mom? I'd love for you to share your stories with me! I did update the Last Chance Accessories List again today. To access it, just click here for the post. I have finished mounting my BRAND NEW STAMP SETS! I just haven't gotten around to making any new projects with them yet...maybe if I feel better this afternoon/evening.